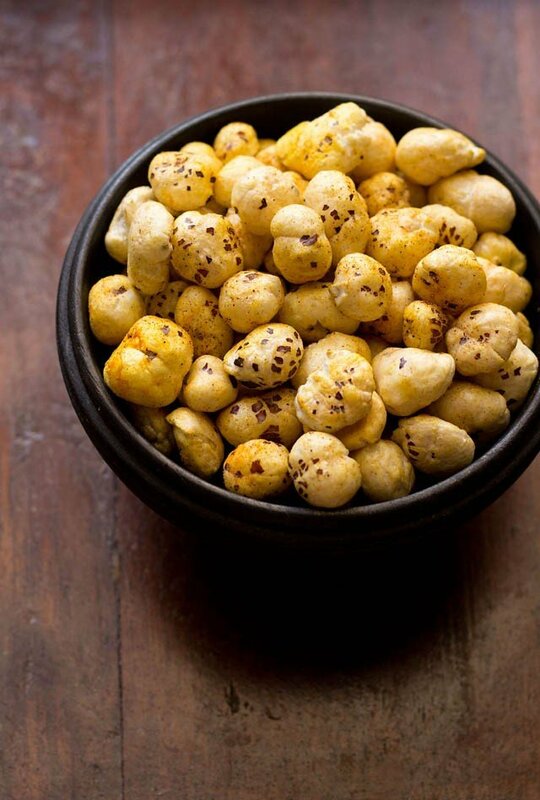 healthy snack of roasted phool makhana or foxnuts. roasted makhana recipe – makhana or phool makhana or lotus seeds is an ingredient i have seen often living in india. i have had makhana kheer before and also had the roasted makhana many times. we also make sabzi with makhana. i have also seen makhana being served as prashad. if you have tasted the makhana with prashad then they are soft. but when you roast them, they become crisp and crunchy like popcorn. but i must say that they are much healthier option than popcorn. makhana is rich in calcium, protein, carbohydrates, phosphorous, iron, thiamine and zinc. makhana have a neutral taste. you can spice it up the way you want. just roast them and when they are cool, store in an air-tight container. anytime you want a light and nutritious snack, just have the roasted makhana. 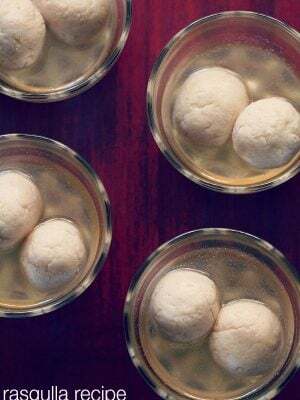 we generally use makhana during fasting as it makes for a good vrat or fasting food. its light on the stomach and nutritious too. in the below pic are the unroasted makhana and straight from the jar. 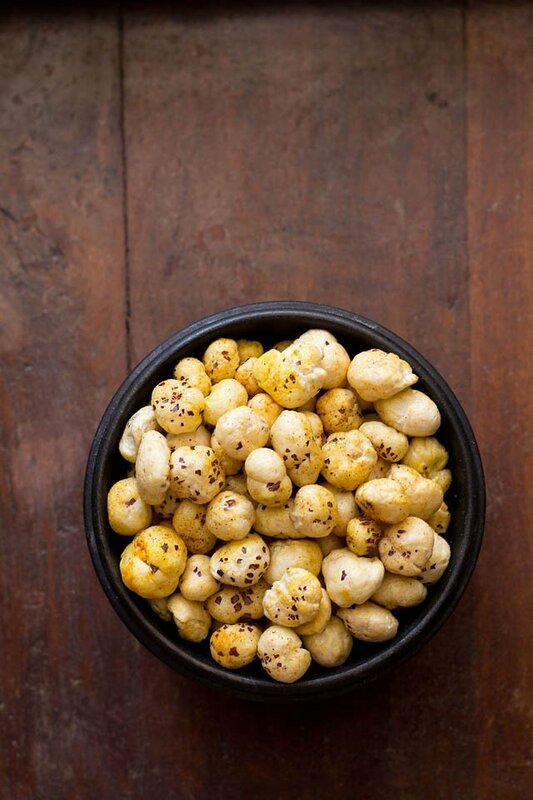 these roasted makhana or foxnuts make for a good in between lunch snacks or evening snack. 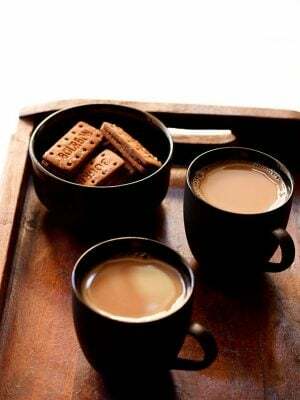 they can be had with tea or coffee in the evenings. i always spice them up with indian spices. i still have to try adding other spices or herbs. 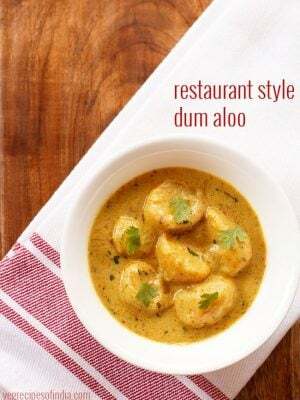 what to do, we love our chaat masala and they way it perks up everything that it is added to, including these roasted makhana. heat oil in a pan or kadai. add the makhana and roast for a good 10-12 minutes on a low flame till they become crisp and crunchy. keep on stirring in between. lastly add all the spice powders and salt, except chaat masala. switch off the fire as you don't want the spice powders to get burnt. stir the whole mixture well. lastly sprinkle the chaat masala powder and again mix well. or once they cool down, store roasted makhana in an air-tight container. Hi.How do you prepare the fox nuts and lotus seeds before frying them?Mine come in the package dry, they are pretty hard. Your recipes look great.Thanks for sharing! i get them already puffed and roasted. but they are somewhat slighty soft. so i roast them again to make them crisp and crunchy. STKFoods are the makhana supplier, makhana manufacturer in Pune! Flavoured makhana are online available at STKFoods. thanks mahesh. good to know this. Can we use dried lotus seeds? even though makhana is called as lotus seeds, they are not actually the seeds of lotus. i have no idea whether the actual lotus seeds are edible and safe for consumption. 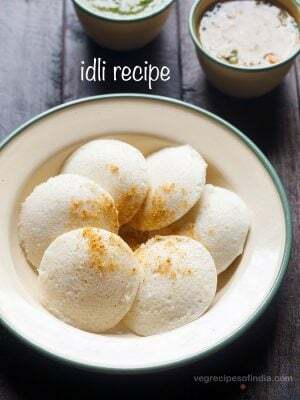 Hello Dassna, i follow your blog for last two years and I like it very much.Can you please share makhana ladoo recipe. thanks sulabha. i will try to add makhana ladoo. i have taken a note of your recipe request. 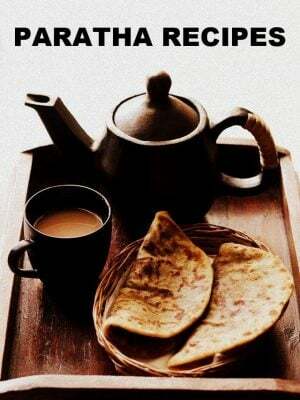 Hello Dasana, Your blog is my ‘goto’ resource for cooking. I tried the roasted Makhana and it is awesome. I do not think I will buy pop-corns now onward. Thank you for writing this wonderful blog and so many yummy recipes; I trust your recipes with closed eyes. Its a good healthy snack. Can you share the recipe for makhana sabzi? 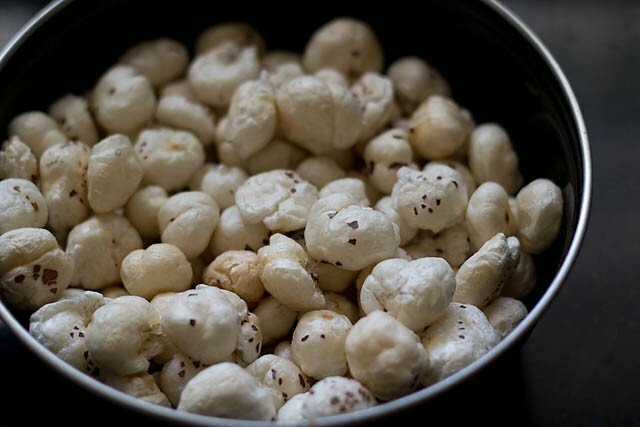 My family love makhana.I use to roast it in microwave by mixing all ingredients in bowl and microwaving for 3 to 4 min…. Give nice tadka with hing, turmeric, mustard seeds, and lots of curry leaves.. If using ghee then add cumin seeds I stead… Roast the makhanas nicely.. Then add chilli powder, black pepper powder and hint of amchur powder.. Roast till they get crispy.. Done!!! thanks again archana for sharing your version. looks yummy and chatpata. 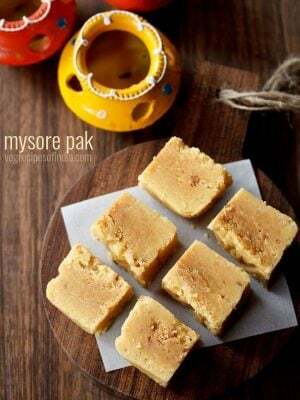 Its to good for health and I will try it because as I’m south Indian we never used this before. can i use normal garam masala instead of chat masala? priya, yes you can use normal garam masala. 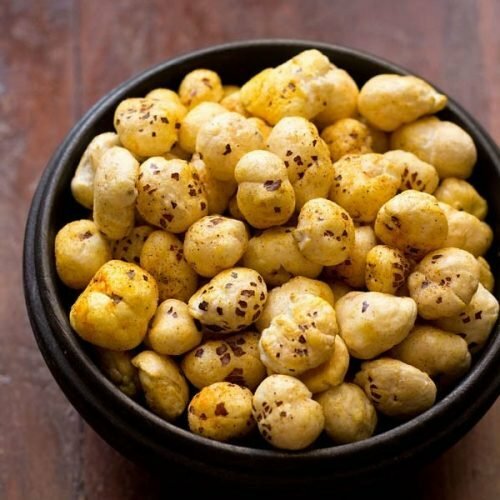 Hi,I am a supplier of makhana/lotus seed/fox nut. It is damn expensive in south india cities like bangalore,chennai,hyderabad,vizag etc. 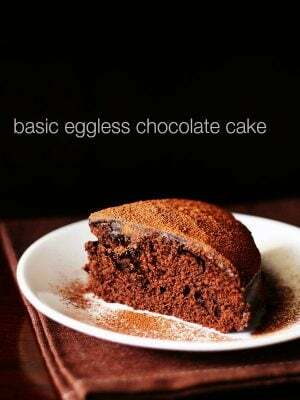 U can buy from me at very cheap rates and try this recipe on your own. If anyone interested,kindly [email protected](9916968612). I purchase these at my local Indian market for $2.49 for a large 7oz vacuum-packed bag. I buy these all the time, as I love to cook them my own way, like popcorn. I use my Whirlypop pan, add some coconut oil and red virgin palm oil, some commercial butter popcorn seasoning and that’s it! I heat the oil up a little, then dump all the Phool Makhana in, stirring it rapidly to coat all the seeds with oil & seasoning, then I stir slowly until they have all browned a little and are thoroughly coated with oil, then dump into a large bowl and serve. No extra salt needed. Popcorn has met its match!! nice to know you get it abroad too. thanks for the info. agree… in fact phool makhana is better than popcorn. It is a myth that this fox nut (Makhan in mithily language) not available in heaven too. no idea vijay. hearing first time about this. Can you clarify how to puff raw lotus seed ? i some quantity of raw seeds. i think they are puffed up on sand. usually what we get in the market is lotus seeds which are already puffed up. you can try roasting a few seeds in the oven or in a kadai. right. what i am mentioning above are makhana seeds that are already puffed up and which are available in the local market. they are referred to as lotus seeds. of course technically they are not lotus kamal phool seeds. Your food photos are amazing. You can share your mouth watering photos with us at foodienewz.com and your photos published on FoodieNewz without any editorial review. These are so addictive and a wonderful snack!